Another treasure from my doll-rooting slave. XD - Welcome to The City of Desire. Actually, this rerooted Fanny Fanny Himeno is supposed to be my early Christmas present. 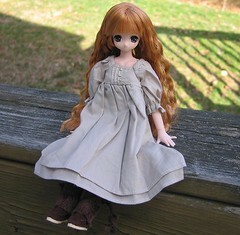 Kristen finished her ages ago, but her dress was delayed by Azone for a month. Her name is Cinnamon. Isn't she lovely? Kristen already owns a non-customized version of this doll--she has dark brown pigtails. The DS version had red hair in a side ponytail. I guess this dolly is meant to be a "super" version of that unattainable doll. I have to say this customized version is much prettier! I guess that some people will say we ought to go to hell for rerooting such a rare doll. I can't resist a brown-eyed doll as a reroot candidate. You can pair those eyes with so many different hair colors. Thank you! I had been dying to get my hands on a Fanny Fanny Himeno to have rerooted for the longest time. I think the standard version is cute enough, but those dark brown eyes are to die for! I wanted to see her with big, puffy hair.